Lenora Jean (Woods) Simon passed away on Wednesday, Jan. 16, 2019, in Hayden, Idaho, three months before her 90th birthday. She lived a full life. Lenora was born on April 19, 1929, in Ragan, Neb., to Robert Newton Woods and Leola Alice Tillotson. Lenora, or Nora as she was known by family, was a strong, smart, loving woman and feisty as heck, right up until she passed away surrounded by loved ones. Throughout her life, her large family was her focus. 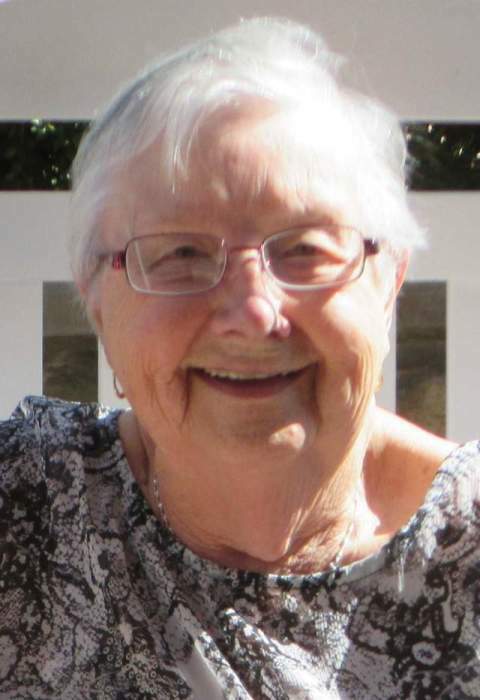 Her interests included her family and friends, her faith in the Catholic Church, flowerbeds, all kinds of berry-picking (blackberries, strawberries, raspberries and huckleberries) and making jams and jellies. In the early years, she worked as a telephone operator before marriage and starting a family. She went back to work after the kids were raised, and retired from Verizon. She is survived by six of her seven children: Terri (Theo) Jackson, Arnold (Anne) Simon, Bill (Cindy) Simon, Diana Simon (Chuck), Jim (Alana) Simon and Jane (Dave) Atwood; 13 grandchildren: Courtney Anne Jackson, Weslie and Kara Barker, Danielle (Adam) Thompson, Dara (Andrew) Giannuzzi, Derek Simon, Desirae (Coby) Monroe, Samantha Krentz, Lindsey Barcklay, Autumn Wood (Ryan), Nate (Haley) Simon, Travis Simon, and Rayla Atwood; 9 great-grandchildren: Jameson Thompson, Maverick Giannuzzi, Calynn and Chesnee Monroe, Gabriel Barcklay, Wynter Wood, Ronan Kurkowski and Ellie and Cooper Simon; her two brothers and one sister: Dean Woods, George (Kathy) Woods and Alice Lee (Woods) Colgan; her brother and sister-in-law, Don and Donna Simon and her many nieces and nephews. She leaves behind a huge extended family, amazing friends and many years of happy memories. She was preceded in passing by her husband of 55-years, Leo Raymond Simon; her son, Thomas Alan Simon and her brother, Robert (“Bob”) Woods. A Catholic Mass will take place at 10 a.m. on June 22, 2019, at St. Thomas Catholic Church, followed by a celebration at the Mica Grange Hall. | 1700 N. Spokane St.